We're back to discussing one of the most important topics for many pet parents: dog food. In this seventh Theory of Pets podcast episode, we'll dig even deeper and talk about the humanization of dog food, changes in the pet food industry and how our current view of feeding dogs and cats has affected the industry, and why every dog and cat owner should care. As parents of children, we understand the dangers of feeding our kids processed foods with potentially harmful ingredients, and we avoid things we don't understand or names we cannot read and pronounce. Would you feed a child food products from a company that has had numerous recalls in just a few years? Unlikely. But why do some pet parents do this with their furry companions? Dr. Jennifer Adolphe, PhD, a senior pet nutritionist for the company Petcurean, will answers some important questions about feeding dogs, how dog food directly affects the health of our pets, and all the recent changes in the pet food industry. She also discusses the many different dog food diets available on the market, and what pet parents can do to ensure their dogs and cats are getting only the nutrition they require. Furthermore, Dr. Adolphe discusses the humanization of the pet food market, and all about the growing trends in the pet food industry today. How appropriate is the vegan diet for dogs and cats? What about raw dog food diet – is it better or worse for canines? Tune into the episode to learn all about these and related topics. Hello and welcome back to Theory of Pets. I know we've talked about dog food before, but today I have a special guest and her name is Jennifer Adolphe, she is the Head Nutritionist at Petcurean, which is a dog food company if you've never heard of them. Petcurean really believes that that one broad philosophy that we see in a lot of dog food products just isn't the way to go, they make a lot of different recipes for individual pets, and again, they have some nutritionists on staff like Doctor Adolphe that work to formulate these pet foods to meet specific needs whether it might be senior dogs or puppies, overweight dogs, dogs with skin issues, all kinds of different things. So that's really kind of their belief, and that's my belief as well so that's why I wanted to talk to you today about the humanization of pet food and the trends that we're seeing in the industry. And what I mean when I say “humanization of pet food” is just that, we are seeing dog food becoming more like the foods that we are eating, the foods that we are looking for when we go to the grocery store. When we go to buy groceries for our family we want all natural organic foods, healthy foods, whole foods, and we're starting to see those trends coming in with our pet foods as well. We're starting to see pet food manufacturers focusing on using quality ingredients; we're starting to see different diets that focus on some of the things that we're concerned about in our health as far as organic diets; we have gluten-free diets; we're seeing vegetarian diets for our pets; we're seeing diets with no wheat, no corn, no soy, things like that. So the humanization of dog food is just that, it's simply the trend in the pet food industry that we're seeing food become…pet food become more like the food that we will purchase for ourselves, and a lot of the diets like the raw food diet, you can buy Paleo dog food now or Paleo pet food. So some of the diet trends that we're seeing are also kind of washing over into the pet food industry as well and is that a good thing? Is it a bad thing? What diets should we be looking into? Are there some that maybe we should not consider at all? You hear a lot of times that the vegetarian diet is not a proper diet for a canine, canines need protein, they need nutrition when in fact and as I will speak with Doctor Adolphe in a little while, that's not always the case, some dogs do thrive on a vegetarian diet. So I wanted to talk with Dr Adolphe about the humanization of dog food, of course she talks a little bit about Petcurean because it's a really great top-quality brand that offers some great pet food and pet products, so I wanted to share that with you guys as well, and we also talk about some things that we should be looking for as pet owners, because if you think about what you do for your dog on a daily basis, certainly the food that you feed him, the diet that you choose for him is the biggest thing that you do on a daily basis to contribute to his overall health and well being. Hopefully you're exercising him every day, but that's not always the case, sometimes there are days when we don't, you have to feed your dog every day, most people feed multiple times a day, usually twice, and that's something that you're doing for your dog every single day, sometimes multiple times a day, that is directly impacting his health and well being, so dog food needs to be something that we educate ourselves about in so many different ways and not just in the ingredients in the food that you're purchasing; not just in commercial foods in general, but we need to really take a look at the different diets that are out there, take a look at the different ways that we can get pet food. There is commercial dog food, you can make your own food, there are prescription diets, so there's lots of different choices, and it can be very overwhelming but the more that we educate ourselves and the more that we help to educate other pet parents, the better choices that we can make for our dog because like Petcurean, I believe that every dog is different, every dog has its own individual needs. Some dogs are more active and they need a diet that's going to cater to that; some dogs are not quite as active, they are on the lazy side so they need a diet that caters to that; some dogs are overweight; some dogs are diabetic, some dogs have kidney trouble, heart conditions, things like that; so we need to as pet parents, and I feel as a pet community, just get the education out there and talk about it. I think people…you know as a pet parent you might feel a little bit embarrassed asking “What should I feed my dog?” If you're a pet owner, if you're adopting a dog obviously you should know what to feed your dog, but that's not true and we need to get past that stigma and start talking about it, have conversations with other pet parents, have conversations with your veterinarian or reach out to a canine nutritionist, they can help you to choose the food that's best for your dog because there are so many choices. It's crazy to think that somebody without the proper education and the proper training would be able to pick the right dog food for their dog, so reach out to those resources that you have with the educational and training, your veterinarian, canine nutritionist. As Doctor Adolphe will point out in just a little while, there are some really great pet food companies, and of course you can't trust everything you find on the Internet, but there are some pet food companies that have some really great resources on their website and it might not necessarily be geared toward their pet food, but just pet food in general, what types of food are available and what things might your dog need in his diet. Look at some of those trusted sources, some of those reputable sources and try and do as much research as you can about the diet that you give your dog because it is single handedly the most important thing that you do that affects his overall health and well being and it can ultimately add years or take years off of his life, so it's something that we need to take very seriously. So that's why I talked to Doctor Adolphe, and I wanted to speak with her about the humanization of pet food and some of those choices that we should be making, and as always you know if you guys are interested in pet topics and all things pet related, I would love to hear from you, you can get on our website which is TheoryofPets.com; there's a comments section there, you can leave comments. And of course if you love my podcast, and I hope that you do, jump on iTunes and give me a review. So here we go – my interview with Dr Jennifer Adolphe. Samantha: Okay, so I'm here today with Doctor Jennifer Adolphe and she is the pet nutritionist for Petcurean. Jennifer do you want to tell us a little bit about yourself and the company? Jennifer: Yes. Hi Samantha. Petcurean is a family-owned, Canadian pet food company that has been around since 1999 and I am the new nutritionist at Petcurean, responsible for product development and formulation of the pet food. And my background is I started my career in human nutrition, I'm a registered dietician and did a Master's degree in Human Nutrition and then I decided that I love pets and wanted to work in the pet food industry and so I went back to school and did a PhD. in companion animal nutrition and then was lucky enough to find Petcurean and start my role as senior nutritionist with them about three and a half years ago. Samantha: Wonderful. It's kind of interesting that you started in human nutrition because what we want to talk about today is the humanization of pet food and kind of how the diet for pets is sort of changing to follow the trends that we're seeing in human foods with like for example gluten-free, we're seeing the raw diet becoming very popular, so it's interesting that you started with human nutrition and have moved to pets. Jennifer: Yeah, I think it's a really good overlap between the human nutrition world and the pet nutrition world, we really want to feed our pets to become as healthy as possible just like with humans, and so there's a lot of overlap and we know that trends in the human food industry are crossing over into the pet food industry very quickly these days, within one to two years, if not faster, and so there is a lot of overlap there and both worlds taught me so I really feel fortunate to work in this industry. Samantha: And you said that they're crossing over fairly quickly, is that do you think because we're seeing obviously the benefits for some of these diets for humans and then people are just assuming that if they're good for humans we should try it with our canine companions or whatever pets we might be feeding? Jennifer: Yeah, I think so. I think that people are more and more often viewing their pets as important family members and so they want to feed their pets the way that they feed themselves, and so they see trends in the human food industry and oftentimes you think that it's may be of benefit to their own pets as well. Samantha: Super. So when we as consumers I guess, as pet parents, you go to the store and it's almost overwhelming now to go into a pet food aisle because there are just so many different diets and trends and you don't really know which ones are the best and which ones you should kind of stay away from, so what should we know about the pet food industry in order to be informed consumers and pet owners? Jennifer: That's a great question, you're right, the pet food aisle just keeps getting bigger and bigger and I think there's something consumers need to know about the pet food industry is that a lot of time and effort and work goes into formulating pet food, there's a lot of kind of nuances and intricacies that go into creating a pet food, you really can't just throw in together a bunch of ingredients and hope that all of the nutrient requirements of the dog or cat is met. So really as a formulator, as a nutritionist when I'm tasked with coming up with a new diet I need to take a lot of factors into account. First and foremost the nutrient requirements of the animal and then I have to think about things like ingredients availability, ingredient cost versus benefit, the health of the animal, and pet food… so it's really a pretty interesting task to develop all of these things. But really one of the important things that I recommend is to not just look at the food itself but to really look at the company behind the food, look at its track record, look at its focus on food safety and kind of learn about the company behind the brand, if it's a good reputable company that is selling that food. Samantha: That's great advice. And when we go in…another thing that, as we mentioned that those aisle keeping getting bigger and bigger, it seems like the labels keep getting more things added to them as well, and I know unfortunately, the regulations for the pet food industry aren't as strict as the ones for human food, so when we're reading those labels are there certain things that we should be looking for or certain things that maybe we should be staying away from if we see them? Jennifer: Yeah, the list of ingredients on the bag is a great thing to start when you're considering a pet food although some foods will…you're right, they're getting longer and longer list of ingredients, there is hopefully a trend which I would say follow the human food industry and that is the limited ingredients diet for pets which in my mind is kind of comparable to the clean label trend in the human food industry. So it's all about using ingredients that are easily recognizable and having as short of an ingredient panel as possible. When you're reading an ingredient panel it's important to remember that the first…that the ingredients are listed in descending order by…so the first ingredient is a list of products contains the most of that ingredient. And so if you're looking for a new food for your pet, look at the ingredients, think about which types of diet and ingredients have worked well or not worked well with your pet in the past and think about what kind of ingredients you want in that mix, and a lot of companies, Petcurean included, we have a great customer service line where you can actually call and speak with someone in person if you need help choosing a food for your pet, and we also have what we call a food finder on our website to help you choose a food for your pet. Samantha: Oh that's wonderful! That's a great tip for a pet parents to try and find a food that's good for their dog. And what types of food, or diets I guess…and/or diet would a dog thrive on? And then are there certain diets that maybe pet parents should try to avoid? Jennifer: Again you want to find the food that's made by a company that you trust and is reputable, but in reality there are many foods that a dog will thrive on. Petcurean believes that a one-for-all philosophy doesn't work for all dogs because each dog has unique needs so what my dog does well on maybe your dog does not do so well on, so it does become a little bit of trial and error and if you feel like your dog's not thriving on a particular food you may want to consider trying something else. The majority of pet owners don't feed their dogs Kennel, and I mean Kennel is a great food format for dogs, it's convenient, shelf stable, safe, nutritious and very palatable for dogs. And a lot of people also go for canned foods or another type of wet foods, which is a great way to add some variety and some flavor for dogs. Samantha: And with the trends that we're seeing now, for example like the raw diet and we're seeing things that are gluten-free, I've heard some not-so-great things about the vegetarian diet, unless a dog actually needs that, but are there…for these new trends that we're seeing, are there any diets that kind of stick out that seem to be the best, or the new best thing I guess, to be feeding your pet? Jennifer: So the like gluten-free option is similar to the grain-free option because we give you grains that contain gluten, wheat, barley and rye contain gluten so if a dog's food is grain-free then it would be gluten-free. And really not all dogs need a grain-free diet, a lot of dogs may actually be better on a diet that includes some grain, but the thing that I like about having the grain-free option is it just creates another kind of tool in our toolbox as a diet option for dogs that may be better on that type of diet. The vegetarian option, all dogs' nutrient requirements can be met through … ingredients and from a sustainability perspective a vegetarian option is beneficial even lower down on the food chain. You're right, it's probably not a diet that's meant for all dogs but it's a great option for people who fee themselves a vegetarian diet and want to have something similar for their own dog. So again I would just recommend that you choose a diet that's made by a reputable company that is formulated by a qualified nutritionist. So there's lots of trends, lots of options, but really trying to find what works best for your individual pet is the ultimate goal. Samantha: So do you think that pet parents should maybe start by talking to a canine nutritionist or their vet and get a starting place or do you just kind of recommend starting out with a good quality puppy food and sort of doing a trial-and-error thing from there? Jennifer: Yeah definitely speaking with your vet, if you've gotten a new puppy speaking with your vet about nutrition, about how much food to feed, all that is a great start. If you want to go with a particular brand you may want to call the company and get some advice from them about which food you should choose. But yeah, really there's lots of great high quality pet foods out there to choose from; but yeah definitely talking with a pet nutritionist or a vet or the customer service team at a pet food company are great places to start. Samantha: And then the other thing that I think is popping up that's more common is we're kind of seeing these life stages dog foods, and some of them are…we see them advertisers for all life stages so you don't necessarily need a specific puppy food or a senior dog food, and then other brands will do a puppy, an adult, a senior, but then do you recommend one or the other of those or are those for all life stages kind of dog foods, are those just as good as the more specified types? Jennifer: So an all life stage dog food will provide…will meet the nutrient requirements of the dog throughout the life span, so from puppy hood to the senior years; however a life-stages diet might be more suitable for some pets depending on their individual health status, the breed, their age, et cetera. So for example our now fresh line of dog food recipes are designed with life stage and breed size in mind, and so those recipes are specific for puppy, adults, and senior and are available also in small breed and large breed recipes. And so if you have say for example an older dog that's not very active then a food that's designed for senior pets that's more clinically lower in fat may be ideal for the senior dog because it'll provide fewer calories and help the dog either maintain their body weight to prevent weight gain or help them possibly shed a few pounds. So again, these are good options but it comes down to choosing what works best for your individual dog. Samantha: Sure. So probably another thing to discuss with your veterinarian or a canine nutritionist if there's one in your area? Samantha: Great! Those are the only questions that I had for you, but if there's anything that you feel like maybe you left out or anything about Petcurean that you'd like to add in that would be absolutely wonderful. Jennifer: Sure. Well I wanted to let you know that Petcurean has recently launched a brand new line of pet food called “Gather”, and the idea behind Gather is to provide food for dogs and cats with sustainability and transparency and organic ingredients are the key aspects of the brand, and we know that one of the biggest trends right now in both the human and pet food arenas are… global warming, climate change, extremes in weather, it's all on their minds, so we just launched Gather in August of this year and we'll be starting to stress the food to reach all stores in October, so we're really excited about that. Samantha: Absolutely, that's wonderful! I agree transparency is certainly a growing trend, and I think sustainability as well I think as we become more eco-aware and more eco-friendly in the products that we're buying for ourselves. I do see a trend in that in the pet industry, not just in food but in all the products that we're buying for our pets, so that's something that we definitely need to focus on as well. So that's great! Kudos to you guys for that. Jennifer: Yeah. Thank you very much. I was going to say one other topic that I'm very passionate about and that I try to talk about it every opportunity I get is for the increase awareness about pets obesity, it's a huge issue in the pet population in North America and pet parents need to be aware about how fat their pet is at an ideal body weight or a little bit overweight and Petcurean offers a body score chart on our website to help pet parents figure out if their dog is at an ideal body weight because really maintaining an ideal body weight is one of the best things pet parents can do to help ensure that their pet lives a long healthy life. So I just put that in there to…I know it's not totally on the topic of today, but just wanted to mention that as well. And people, a lot of times I don't think they realize that their dog is overweight and that that's a really serious thing. I think the other thing I hear often too is “Well I know he's overweight but we like to give him table scraps,” or “He gets his treat every day,” or whatever the case may be, and I don't think they realize quite how negatively it affects their health and how quickly that it can really make their health go on a downward spiral. So I think that's a very important topic to talk about as well. Jennifer: Yeah I agree. I think that because obesity has become so prevalent we start to think that body shape type is actually how pets should look, but it's not until people are educated and really realize what is an ideal body weight that they realize “Oh yes my pet is a little bit overweight.” You're right, yeah, people need to really consider that, some of the research that I did show that there were changes in heart function after just a few weeks of obesity, so you're right, it really can have a quick impact on health, and some research have shown that can decrease the lifespan of dogs by as much as two years, and for an animal that only lives 10 to 14 years typically that's a significant decrease. Samantha: Yeah absolutely. Whenever I talk about obesity that's the one thing I always lead off with because I don't think people realize when you say it can take a couple of years off your dog's life it really kind of hits home and makes them realize just how serious of an issue that it is. We think, like you said I think we see so many chubby little dogs and then they're so adorable and everybody kind of thinks that that's the ideal, but it's actually it's very detrimental to their health, so I appreciate you throwing that in there because like I said, anytime you talk about pet food that's certainly a topic that goes hand in hand. Samantha: I hope you guys enjoyed that interview as much as I did. I learned so much from talking to Doctor Jennifer Adolphe and I want to thank her very much for coming on the show and being on the podcast, I think that was very beneficial and a lot of great information, and of course at the end there she touched on pet obesity, as I said I think that anytime we talk about dog food we also need to touch on pet obesity, that is an epidemic in our country and it's definitely something that goes hand in hand with pet food. So as Doctor Adolphe mentioned and as I will also mention to you guys, if you have any questions at all about pet food, absolutely by all means do your own research but speak with a trained specialist, speak with somebody who knows about pet food and the nutritional needs of dogs and specifically the specific needs of your dog. So if you can speak with your veterinarian or set up a time to meet with a canine nutritionist, somebody that can look over your dog's overall health record, his health and well being, everything from the condition of his teeth and his skin and his coat to his age, his weight, his breed, and know what type of food would be best for him. So that is my recommendation to you. If you have any other questions, of course jump on TheoryofPets.com and leave those there, I will try and answer anything that I can answer, and if I can't answer it I'll certainly find the information for you. If you have any questions feel free also to leave them there, there is a spot where you can record your questions or your comments and I may use them on future podcasts. If you're not comfortable being on a future podcast, that's not an issue either, we have a section where you can type those comments and questions, so I am always looking to hear from you guys. And again if there's anything I can answer, if you have the questions chances are there's somebody out there listening who has the same questions so do us all a favor, share those questions, share those comments and I will be sure to get back to you. If you guys enjoyed the podcast, please take just a couple of minutes, jump on iTunes and leave me a good review, that really helps me get the word out about the podcast which will help me grow it faster and be able to get more specialists like Doctor Jennifer Adolphe on with me. So if you guys could take a minute and do that, I would greatly appreciate it. I will see you back next time. 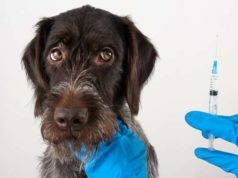 I am going to, on a different track but definitely related, next time I'm talking about pet diabetes, specifically dog and cat diabetes, that is something that is a growing epidemic as well and it's something that I think a lot of pet owners aren't educated about and they don't know what signs to look for, as many as one in five dogs now have canine diabetes and I'm not exactly sure the statistics on cats but that's a growing number as well, I know it's less in cats because cats can actually go into diabetic remission. So anyway but it's something that we need to be educated about and it's something that all pet parents should know about, whether your dog is diagnosed now or you just want to be educated about it because you never know when those signs could pop up. So stay tuned next week for that and I will see you guys back next time on Theory of Pets. Thanks for listening.